Since I began eating super low carb – or “keto” – I have been experimenting with all kinds of fun recipes – some of which have been absolutely amazing… and some of which I have literally thrown out and tried to hide the evidence before Mike got home. One of the things I have been most impressed with is how sometimes the simplest of recipes end up tasting the best. These Two ingredient Cheese Crisps are no exception. I discovered this kind of by accident and have become completely addicted to these – changing up one of the two ingredients to make a completely different flavor. 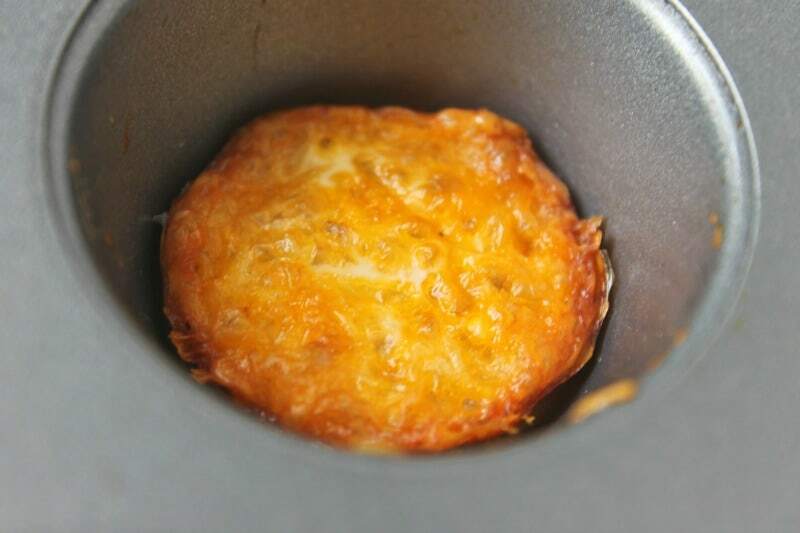 I was making my beloved Breakfast Casserole Muffins when I “discovered” just how tasty these Cheese Crisps are. I have since changed them up by trying different types of cheese (extra sharp is my favorite!) as well as mixing in different seasonings. You can sprinkle in some cayenne pepper for a spicy kick, cumin for a bit of a Mexican flare, or even crumble up crispy bacon for a breakfast crisp! My only warning with these – is to be careful how many you eat! I can polish off the entire batch in one sitting if I am not careful. They are just TOO good! These Cheese Chips are so easy to make – they are perfect for unexpected guests, gatherings, and when you just need a bite of something without messing up the kitchen! I love that it takes literally seconds to throw these together – using ingredients that everyone keeps on hand. 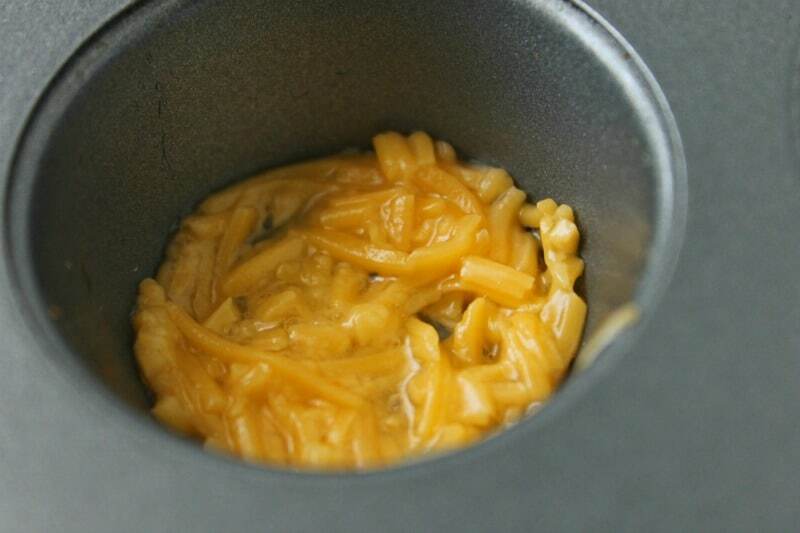 You can even choose to spice things up with different seasonings or adding more than one type of cheese. These delicious little Cheese Chips save well too! Just put them in an air tight container in the refrigerator and voila! You can heat them up again in the toaster or eat them chilled. I have even topped them with chicken salad for a more substantial snack. « We Picked A Date! These look amazing! I’m going to try them today! Oh my goodness. These look so good. Def will be trying these soon. Thanks for the recipe!! Only 2 ingredients? Amazing. Sounds so easy. Can’t wait to try them! I am so making these Sunday! These look so easy and yummy! Thanks for sharing! That couldn’t be more simple. They almost look like a flattened tater tot with cheese oozing out. Yum I love cheese! These look so simple to make! Tried these and the family love them. I had to click when I saw 2 ingredients, my type of recipe and this looks awesome. Do you need to refrigerate if you make at night and have leftovers? Same issue…will have to try again, but grease pan with something else. Could these be done in just cupcake papers? I can see the sense behind containing the material in some way, but don’t have the muffin pan. Looks good! how much of the cheese mixture are you adding to the muffin tins? And then spread it around in the tin? It will just crisp up into a bite size piece? I have a large cube of cheese. Do you melt it or shave it before adding egg whites? I would suggest shredding it – it will make it easier to work with. You do not need to melt it. These look good and simple to make. Did you spray anything in the muffin tins first? Just made two batches of these and they are fantastic! I sprayed the muffin cups with non-stick spray and they came out easily. Made the first batch with cheddar and a bit of garlic powder. I got creative with the second batch, using a mixture of Asiago, Parmesan, and provolone, then mixed in garlic powder and some Italian seasoning. They are delicious! Thank you so much for sharing this recipe. Do these have to be eaten right away when made? Or what is the best way to store them? Just made these and WOW!!! Delicious. I used sharp cheddar with dried rosemary, garlic powder and crushed red pepper flakes. Oh, I also used mini silicone muffin tins. Worked like a champ. Can you use egg whites in a carton? For my pizza crust, I use 4 whole eggs and 6 oz. mozzarella or provolone cheese. Just mix and spread on parchment paper. Then pop in the oven at 400° for 15 min. or ’til golden brown. I let it cool then top it with tomato paste, oregano, linguica, onions and MORE Cheese. Raise oven temp to 450° and bake for 10 mins. OMG these were amazing! I used a horseradish cheddar with some everything seasoning. Mine were more like puffs than crisps but they were scrumptious and so easy! Absolutely fantastic. I tried different cheeses and spices and most came out great. Thanks for the recipe! Love all the comments…can’t wait to try. I plan on using my new air fryer instead of muffin tin and heat up my big ol oven. Oh Lynsey, these little crisps are amazing! I follow the Trim Healthy Mama plan and low-carb eating is a big part of it. This is perfect for THM-S snacks or meals. BTW, I didn’t have a mini muffin tin so I made a half recipe and baked it in a jumbo tin of 6. They were perfect. I put a dab of sour cream on them. Yum! I made these using parchment paper on a cookie sheet. Just spread the mixture into a thin layer and bake. When done cooking, I cut it into pieces with a knife. Turned out oh so crispy and delicious! So yummy! I will be making these again! can these be baked on a sheet of parchment rather than in a muffin tin? 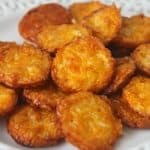 What a great Keto snack! Didn’t bother separating the eggs; yolks are good food! Added 1 tsp Baking Powder, just before portioning out. 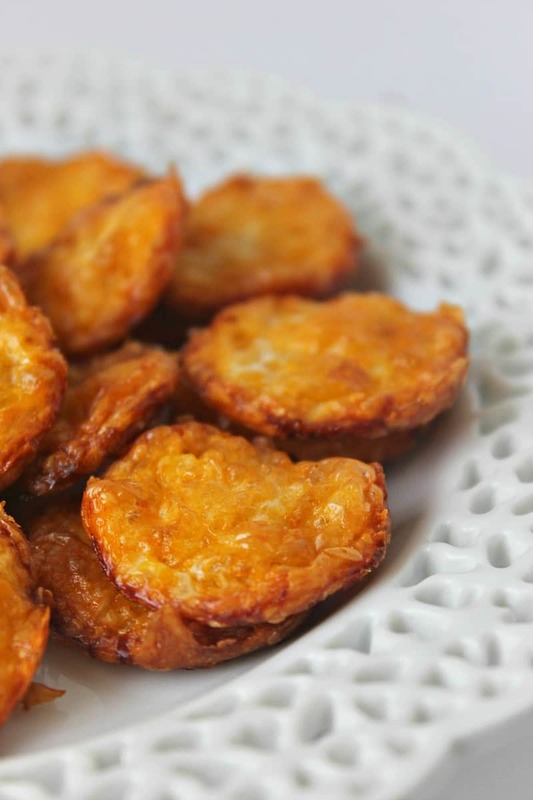 They came out golden all over, about 1/2″ thick, halfway between crispy and fluffy/chewy. Next batch will be straight, without the BP, for a comparison. Either way, a real winner – thanks! I just made these. They are amazing!! The only problem I found is that you can’t stop eating them. Simple and delicious! Thank you for the recipe! Made these this evening, they were great!! 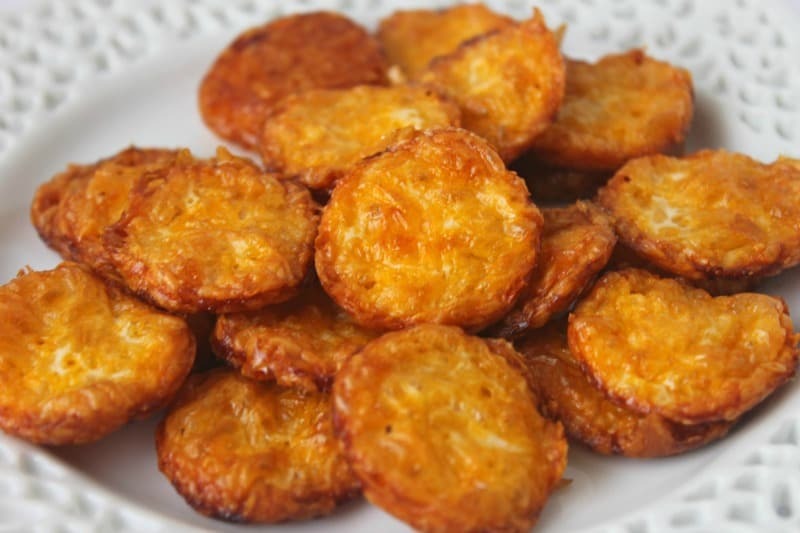 Ohhh….. these looked easy, I love cheese, so decided to make them. I’ve eaten them all!!!!! They were delicious!! Just working out what I’m going to change in tomorrow’s plan so I can have them again! Thanks for the great idea! I’ve been buying these at the store but would much prefer to make my own. Thanks.